Stopping at 15-2 . 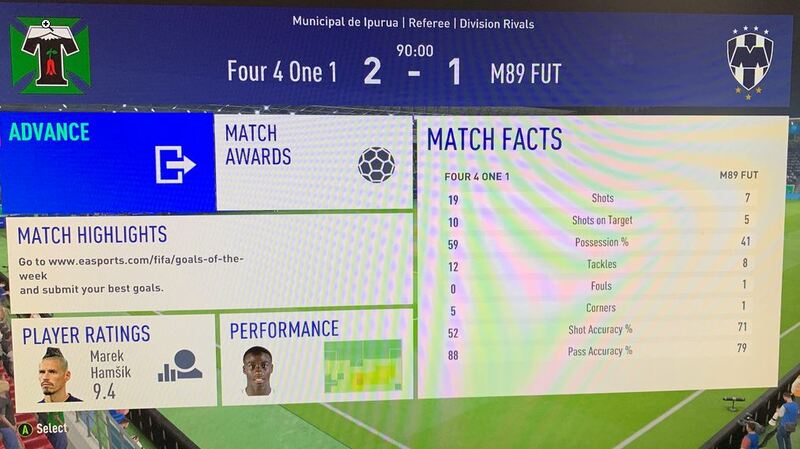 Just went against some top 100 who beat me 4-0. 3 of those goals were that stupid 5* Skill + Cross where my defenders just slid, and left his CR7/Socrates wide open. So ridiculous that it’s easier to score from that then 1 on 1s. Well done though at 15-2! Very ridiculous, and super annoying because he could’ve beat me without having to abuse a mechanic. And thanks! Hoping to hit back-to-back E3 tomorrow. What is the defensive tactical counter to opponents who use fast build up? With Press After Possession Loss or just Balanced/ PafterHT with a high line? Would you mind giving a quick review of 88 Matthaus compared to other icon CMs? I loved Matthaus. Best value in the game imo. 16-4 now. Lost 2 games where i was 2-0 up. Conceded a pen in each game where i didnt press tackle but the striker ran straight into me... good times. Gonna retire on 17 again as its just boring outplaying people for them to score via stupid exploits like 2 men stepping over a free kick and then receiving a pass and tapping in. Won 1 game with 9 men due to every tackle being a yellow card. Cracked me up seeing him still have 6 players set to stay back against 9 men..... the state of this community is unreal. If opponent play fast build up when opponent player control the ball his team mate will make run forward no matter what and easier to intercept imo. What tactics is everyone running with this WL? Using my CTs from front page. Finished on 23 wins. Mad at myself; made it to 23 with 4 games left, and I lost them all. Finished on 20-7. Got 3 wins in a row last night which i couldnt believe. Came up against 3 kn0bs that move their goalkeeper but managed to throw em off and shoot in the other corner. Ended on 17-6. Too much pain in my back to play more then. Should have scored more goals. He had a Barca themed side with Ronaldinho, Messi, Neymar, Suarez, Scream Busquets and subbed in Zlatan as well. Doubt he'll put it in. Great result. CT and team? anyone used TOTY Mbappe ? I changed the width to 3. The my attacking CM to Balanced, and both cover center. Also on my attacking I have for both fullbacks to join the attack when I’m down on goals, or can’t break my opponents defense. I see Hamsik got a 9.4, how you finding him ? Good work beating him, repping the 4411 ! Hamsik is very good. Excellent passing and shooting. Good at winning the ball back as well. Not the best header, but I'm very happy I did the SBC. Is it possible to use Torres in this formation? I have used FB Torres 28 matches as ST. 89 Cruyff behind him. Scored 39 goals and have 18 assists. Really want to get him. Looks like a perfect LCM but can’t figure out the links and don’t have enough icons to cover it.